Estimates of how much the human body is made up of water vary, but on average it's about 70% in a healthy adult and that's a lot. We are also constantly told it is healthy to drink a lot of water. But do you find this difficult? If you do manage to drink water do you constantly pass it straight out again? Not all water is the same. Nikken Pimag water is specially conditioned not only to be the healthiest out there, but to also be easy to drink AND absorb. The more you drink the more you want. It is therefore one of the easiest, cheapest, and most passive ways to improve your health. You have to drink anyway, why not drink water that tastes great, is cheaper than inferior bottled water, and is actually going to re-hydrate and energise you? 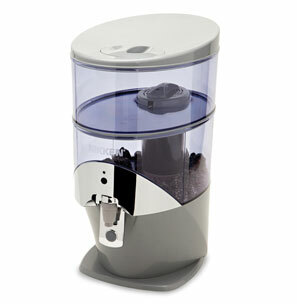 Available through the beautifully designed stand alone Waterfall filter pictured below, or a Sports Bottle.